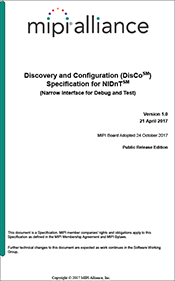 MIPI DisCo for NIDnTSM incorporates the MIPI NIDnTSM (Narrow Interface for Debug and Test) into the MIPI DisCoSM (Discovery and Configuration) framework. MIPI DisCo for NIDnT allows system software to enumerate and discover debug technologies found in the hardware, within a system that supports the MIPI Alliance debug interface and/or protocol specifications. The MIPI DisCo framework is a uniform ACPI-based software architecture providing mechanisms for system software to enumerate and discover the capabilities of hardware devices. The MIPI DisCo architecture is designed to support a variety of device types found in a typical smartphone, tablet or similar mobile appliance, such as camera, display, audio, sensor and storage. These specifications are intended for use by system firmware/software developers addressing MIPI-based systems. DisCo for NIDnT allows any implementation of MIPI NIDnT in a system to be exposed via the MIPI Alliance DisCo architecture. The debug software running on a target system (TS) will utilize the MIPI DisCo architecture, and use the ACPI structures to discover and configure the implemented MIPI NIDnT technology on the TS. It is assumed that the TS is ACPI-compliant and contains the necessary firmware to present the MIPI DisCo data to the debug software. MIPI NIDnT allows the reuse of existing external interfaces for access to basic debug, trace of application activity and hardware test capabilities. A debug and test system (DTS) software will want to discover the capabilities of a given TS. Once the DTS knows the capabilities, it will also want to configure the capabilities to allow the reuse of the existing external interfaces. The MIPI DisCo definition for NIDnT provides the DTS software with a consistent mechanism to interact with the MIPI NIDnT implementation locally on the TS. This specification defines the requirements for this mechanism. In addition to the requirements stated in this MIPI DisCo specification, all requirements given in MIPI DisCo shall also be followed. Not all TSs will have all of the MIPI NIDnT capabilities specified in MIPI NIDnT. A system or SoC designer may choose to implement as many of the listed capabilities as the hardware owner feels necessary. The structures defined are also intended to inform the debug software of which capabilities are available and the methods to use to configure them. Visit the MIPI Alliance website to learn more about MIPI DisCo and MIPI NIDnT, as well as the entire portfolio of MIPI specifications.